I was asked to write a review of Pasta Bar Veneto for a magazine quite sometime back and was sent there to taste their food. It turned out that the restaurant knew about it and the discreet nature that I thought it was for that review was not there, but nevertheless my friend and me had a great time. The interiors of this branch of pasta bar is quite nice with a tree going right through and a small outside area for smokers. We were served some mozzarella cheese fingers which was superb. 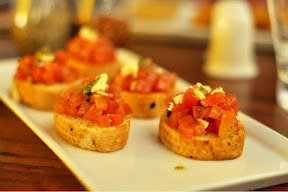 The tomato topped bruschetta was equally good and set the table for the rest of the food to follow. We were then offered some wonderful salad, with loads of chicken, lettuce, olives and nice salad dressing to complete the healthy beginnings that Italian cuisine is known for. This was followed by some varieties of pasta, of which the primavera was edible, while the basil penne was a just too bland for my liking, but it is pretty authentic if that's what you are looking for, it felt like eating pasta in Europe and brought back memories.......somehow, though the place has pasta in the name, that seems gone their weak link in the menu. The menu was pretty entertaining and that was nice to see in Chennai. The lasagne that was served was nice and juicy with loads of chicken and well baked. 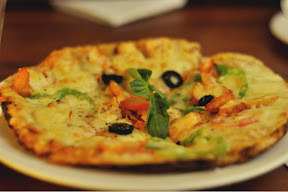 The slightly burnt, thin crust pizza that came in turned out to be excellent and was a fitting end to our main course. And then came the best part of the meal, the deserts. 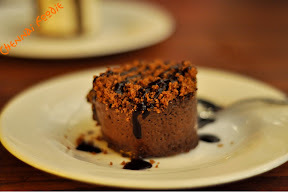 There was a Mud pie that fell straight from heaven. We liked it to the last morsel, while the tiramisu, though a little frozen for our liking, tasted very nice. Prices are on par with similar eat outs in chennai, with main courses being priced around Rs. 250 and starters and soups at around Rs. 90 to Rs. 150. 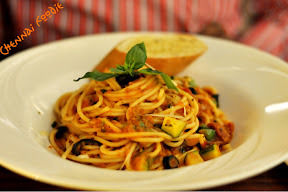 While it is not the best Italian joint in chennai, it is worthy of consideration when you are in the mood for some Italian.